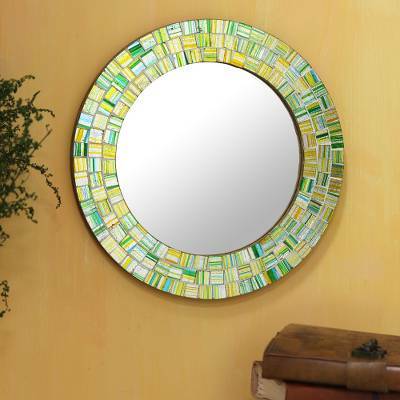 Artisan Crafted Round Glass Mosaic Mirror in Aqua, "Aqua Trellis"
Frame: 1.5 cm H x 25.5 cm Diam. You can find glass mosaic mirror 'Aqua Trellis' by Kamal in wall decor categories such as Mosaic Mirrors, Glass Mirrors and Wood Mirrors. Enjoy exploring these sections for other Novica treasures.